Things I've Left Behind....: Does a Recliner have 9 Lives? Does a Recliner have 9 Lives? 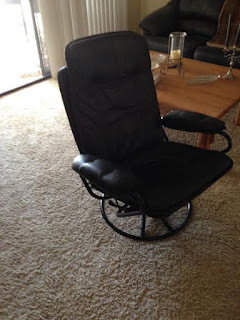 Some time has now gone by since my psychopathic recliner tried to take my life. It sat around my living room in it's compromised condition until Monday, when I decided to take it down to the road for trash pick up. First it was the frame that took it's last walk down the driveway to oblivion, then I returned for the leather insert. As I lifted this expensive piece of leather that has been with me since 1992 when I purchased it at an upscale Scottsdale furniture store. The price of $500 comes to mind because remembering numbers is my game. In today's money market that would equal about $900 for this lovely piece of craftsmanship. I started thinking. This beautiful chair that I'm really very fond of and I have been together for 23 years and cruised through life together for many, many, emotional miles. I've had it welded on 2 different occasions. First for $50 and then soon after for $100. Why not give it one more reprieve? Putting down my hunk of burning love (the chair), I ask Siri if she knows of a welder here in Scottsdale and she immediately blurts out an answer. Paul's Mobile Welding and then she asked me if I wanted her to dial the number for me. I said, yes! Paul answered with a casual, hello and I got the impression that he was at home watching the Dr. Phil Show. I told him of my predicament and he told me that he gets $150 minimum for coming out. Laughing I told him that in that case, Old Bessie, the recliner is going to the curb! Paul then told me of a friend of his that has a shop at 25th St. and Bell that if I'm willing to go there, he'll do it while I wait. He even gave me the phone number, 602 867-2729. I called and Tex answered, Allstate Steel with an old country boy accent. He said his minimum was $32.50 and he gets $65 an hour. I thought how much could it be to weld a 1" pipe that broke? For me it was a straight shot up the 101, about 15 minutes total time. He was located behind the pawn shop that an old friend of mine formerly owned. I pulled in with no difficulty and Tex was just like his name suggests. Tall guy, about 6' 1" with a ten gallon hat and an accent from somewhere in Texas, maybe New Mexico. He was the owner and worked everyday of his life, or so it seemed. He operated out of an old trailer and was as friendly and warm as anyone I've ever met. He walked me outside to look for Ernesto, the welder. Only Ernesto was nowhere to be found. Tex said he must have gone home, can I leave it with him? Naturally I agreed and left him with my name and phone number. It was about 110 degrees and I was ready to get back into my air conditioned car. I left. That night I couldn't sleep. One of the many things on my mind was the fact that I never asked Tex, how much. I pictured him telling me that it took a lot longer than he figured and it was be a full $65. Then as the clock ticked away I thought, what if he claimed it took 2 full hours and he wanted $130. I should have asked him to commit to a price, what is wrong with me? I've been around long enough to know that you just don't trust a total stranger to be honest with you. What is this 1955? I finally fell asleep with the aid of a sleeping pill. The next day I waited for them to call and tell me it was ready but that never happened and I kind of forgot about it. I already had decided that if it was more than $65 I was going to tell him to just keep it or charge me a fair price. Now it's Wednesday afternoon when I finally call. His assistant, probably his wife answers and I tell her my name and ask if my chair is ready. She says, yes! I take a deep breath and ask how much the damage is. She says, hold on while I look. My mind is going wild now. I'm preparing my dissertation for when she tells me it is $400! She comes back to the phone and says, $15. A tear forms in my eye, as it is while I write this and all I can say is, why? She replies, it didn't take very long. I begin to argue (stupid, stupid, stupid). I was told that there was a minimum of $32.50 for any work at all. She says, you'll have to talk to Tex. Embarrassed and ashamed I drive over there to pick up my old friend, Bessie. When I get there Tex is behind the counter along with the lady. She takes out an invoice and says, $15. I give her $20 and ask her to please keep the change. Tex hears this and hands me a $5 bill and asks me to go out back and please give the money to Ernesto. I do. When I return, they have already put the chair into my car and said goodbye. I immediately called my son Brad and asked him if he had anything that needed welding. He thought for a second and said, no. I told him to go break something!